Home » Sri Yoga Studio » What is Yoga? Among the greatest misconception Westerners have about yoga is that it is a religion. Actually, yoga is a philosophy of how to live a healthy lifestyle and is not associated with any religion. Persons of all religions benefit from the practice yoga without compromise to their religion. You probably know someone who has had a positive experience with yoga, perhaps a neighbor, family member or acquaintance. If you do know someone, most likely you heard what a positive, relaxing experience they had. They may have said it helped them manage their daily stress. All of this is true about yoga and you can expect to feel better after a class than you did when you arrived to attend class. Sounds good, yes? Now that yoga has become so mainstream in our Western culture, there are DVDs, podcasts and even some cable programs. So why bother to attend a live class? There are many reasons to have a live teacher present when you practice any type of yoga. First of all, the practice of a relaxation breath or a stretch or your standing posture bears infinitely better results when practiced correctly. Without a live teacher present, we may practice incorrectly because it is explained poorly or because what we think we see or think we hear is not what our body is doing. A live teacher sees what you are doing, what you think is correct and through an assist or correction, can help you feel it in your body. A good teacher is able to show you options/alternatives to whatever she/he is teaching if it is not quite within the reach of your body, breath or posture. So, anything other than a live teacher may demonstrate for you, but a live teacher can instruct you. In summary, nothing can substitute for a live teacher in your own evolution. Many people find additional benefit in being part of a studio class because there are all these other people trying to figure it out along with you. Support is a real asset when we are learning something we cannot so easily accomplish. Yoga asks us not to compete with ourselves or others. Being in yoga helps us focus on what we CAN accomplish. Yoga breeds a positive outlook. Yoga teaches us how to identify where we hold stress in our body or mind and how to leave it behind. In the West, much is missing in the practice of yoga. By and large, yoga is understood as some postures, some breathing, some stretches and some kitschy phrases that are practiced in the studio but forgotten when student leaves. 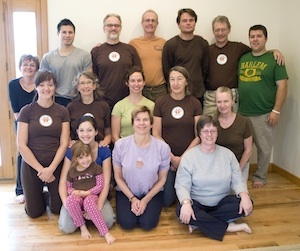 At many studios the 4 o’clock class teaches this brand of yoga and the morning class teaches that brand. One instructor turns up the heat and another moves through a challenging sequence without integrating breath, body and mind. Western students call yoga “great cross training” and imagine it to be all about core strength as defined by our Western Culture. Yoga of the East has a whole different take on what the core really is. Hatha yoga allows us to approach that core through the human body. Long, long ago hatha yoga was codified in order to strengthen the organs and nervous system to prepare us for the journey toward our core. Pandit Rajmani Tigunait of The Himalayan Institute, says only one of strong body, focused mind and determined resolve (Will) can make that journey. There are actually many yogas. To mention a few, there is hatha yoga, which approaches the mind through the handle of the body; Jnana yoga, about knowledge and scholarly study; Bhakti yoga whose practice is based on devotion, prayer and poems or song about The Lord of Life; Karma yoga which is all about taking our higher self and purpose into our daily life at work and home; Dharna which is about concentration and keeping the mind focused and Dhyana yoga which is meditation: not unlike the mysticism found in spiritual practice around the world, throughout time. Then, inside of the yoga you study, lets say Hatha Yoga for example, there are many traditions or approaches.